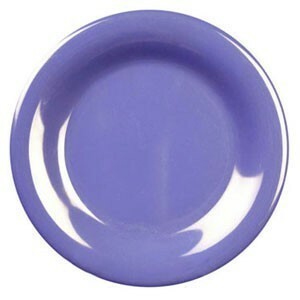 Showcase your delectable creations with the Thunder Group CR005BU Purple Wide Rim Melamine Plate 5-1/2". Featuring a gleaming finish, this piece of dinnerware comes in blue, red, green, orange, ivory, and white to beautifully complement a variety of table settings. Thanks to its heavy duty melamine construction, this dishwasher safe, NSF certified purple plate guarantees exceptional durability and is designed for safe use at high temperatures.